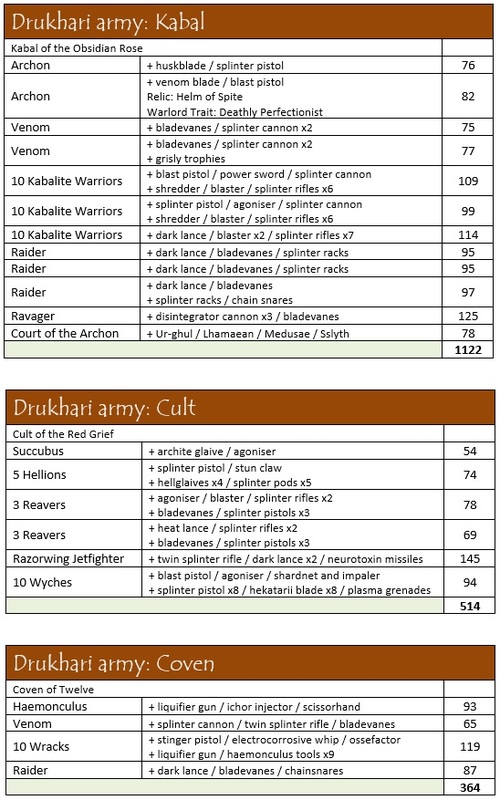 For the past few days, I’ve been fiddling about with a redesign for my Dark Eldar army, taking the list to 2000 points based on the models I already have fully painted. It’s been quite the task, as I’ve only played with the army using the codex once, but I’m excited to actually bring the list to the table soon! 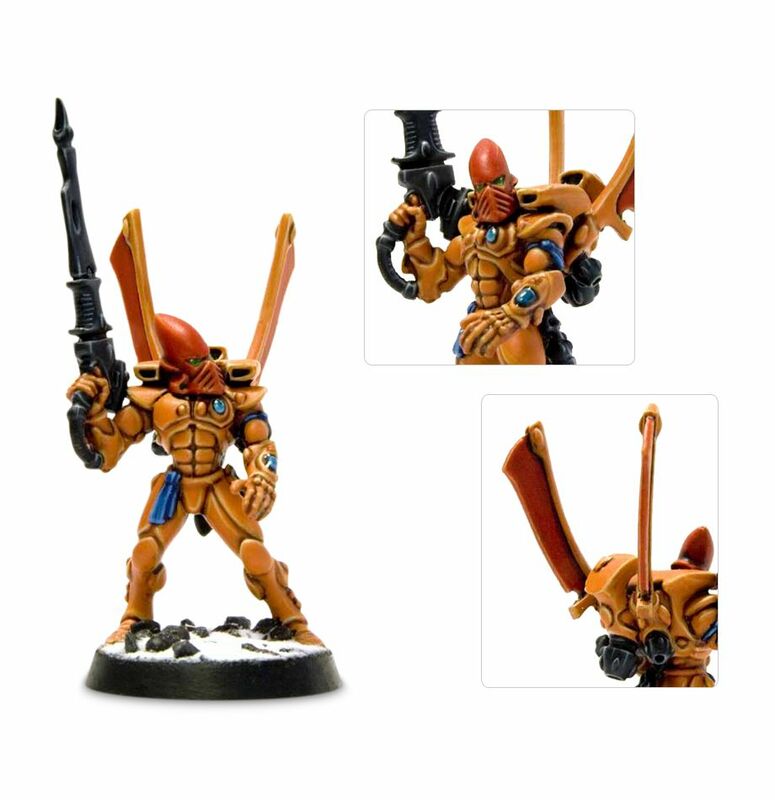 I’ll be talking about this in more detail this coming week, but in doing this research, I’ve been looking at Eldar Corsairs as one of a couple of possible allied detachments, and I’m actually really intrigued by how this might work out! In case you don’t know, the Corsairs are a sort of outcast band of the Aeldari in Warhammer 40k, basically more classical pirates than anything else. 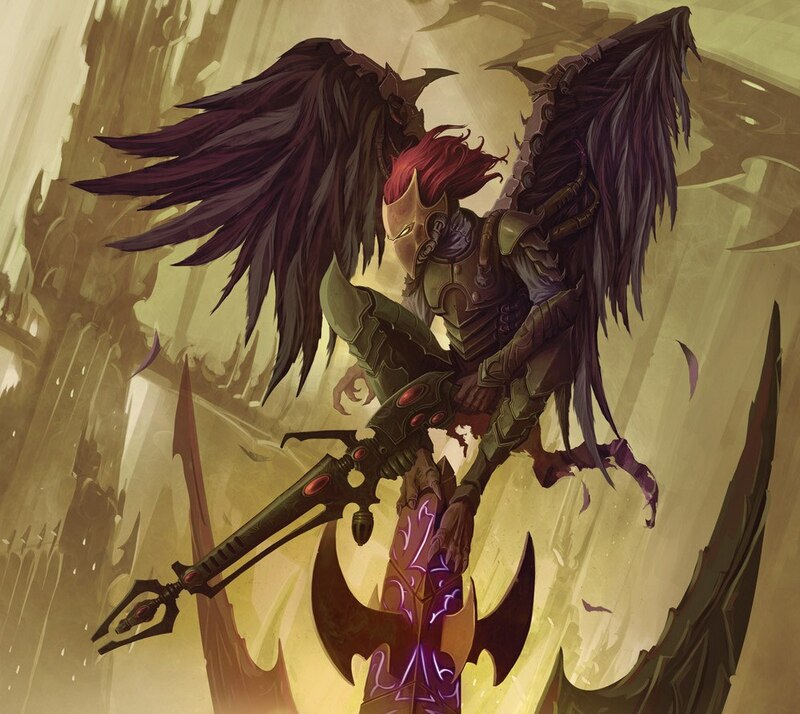 Following the Fall of the Eldar after the birth of Slaanesh, while the Craftworld Eldar began to lead lives of asceticism lest they attract the gaze of She Who Thirsts, and the Drukhari subsumed their psychic potential and retreated into the Webway, the Corsairs stayed more true to their original life, heedless of any acts of passion. 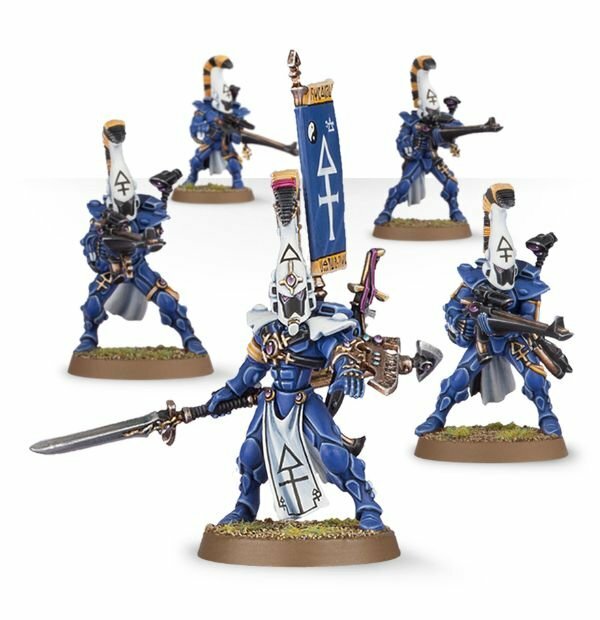 For a long time, ForgeWorld produced the army much like they do for other factions, but back in 2018 (I think) they discontinued the whole range, meaning that anybody wishing to play them would have to start a serious conversion project. Corsairs have always been conversion-heavy, so I believe, but now the problem is increased! However, I do like the rules, as I think there could be an interesting slant to the army from using these guys. Let’s take a look! They have two specific rules that can be thought of as army-wide: Reckless Abandon and Dancing on the Blade’s Edge. Reckless Abandon is probably my favourite, as it allows the unit with this ability to move 3″ in any direction if they inflict one or more casualties on an enemy unit by firing Overwatch. I like the thought of spoiling a charge move in this way, though obviously it would only really work on a squad-type unit making the charge, and there are plenty of ways to get around that. Dancing on the Blade’s Edge allows you to roll 2 dice for a Morale test, and discard the highest (per the FAQ). However, if the test is still failed, +1 model flees. While the weapon options for these guys are pretty diverse, they all seem to come stock with a brace of pistols, which is an 8″ Pistol D6 weapon that is similar to the splinter weaponry of the Dark Eldar in that it always wounds on a 4+ (except vehicles, which it wounds on a 6+), and any rolls of 6 are resolved at AP-1. They’re 2 points a pop, and 4″ shorter than standard splinter pistols, but that additional point of AP is definitely worth it, I feel. 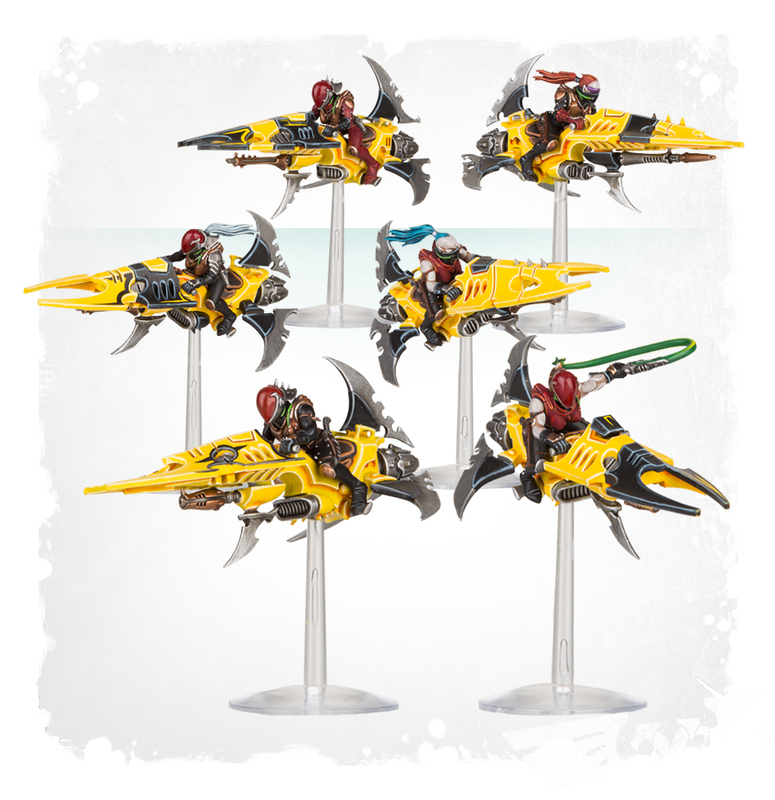 The Imperial Armour Index only includes three Corsair units: the Reaver band (basic troops), the Skyreaver band (jet-pack troops) and the Cloud Dancer band (jetbike riders). The FAQ does state that the army can still use Corsair Princes or Corsair Barons as an HQ choice, using one of the three datasheets printed in the Index as best describes the model. 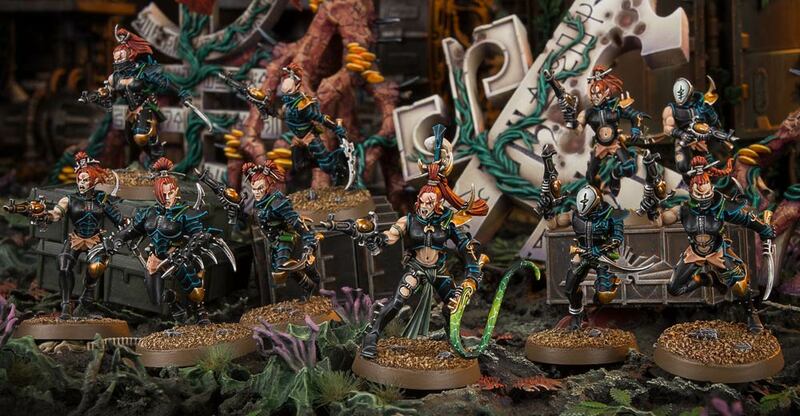 Additionally, Corsairs can use Venoms and Falcons from the Drukhari and Craftworld codexes. 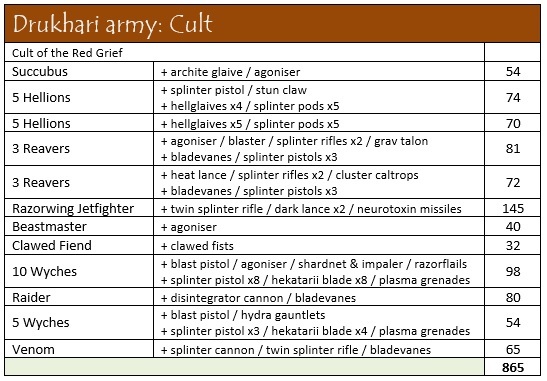 Of course, this does limit the options available to the army, having such a limited pool of units to choose from – back in 7th edition, the army was much more fleshed-out, through the use of Craftworld units alongside Corsair-specific squads. 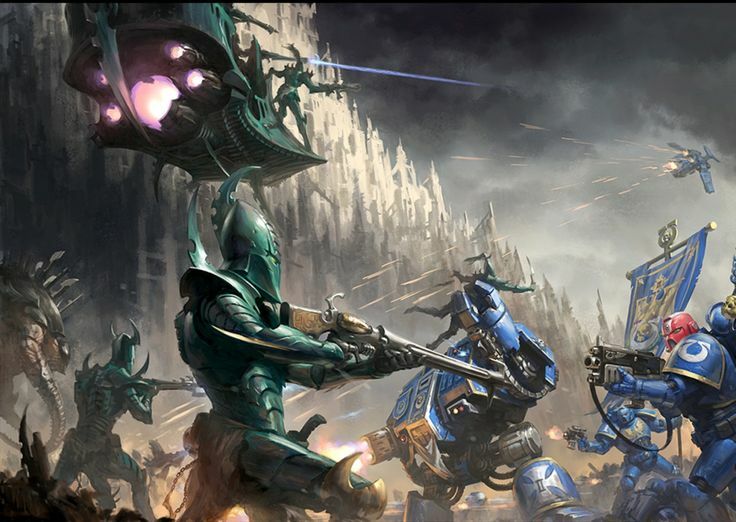 Whether there is any truth to the rumours that the loss of the Forge World upgrades means we’ll be seeing new plastics, I don’t know, but it could be interesting to see if anything will come of this now that the main armies have all had their codexes for 8th edition. 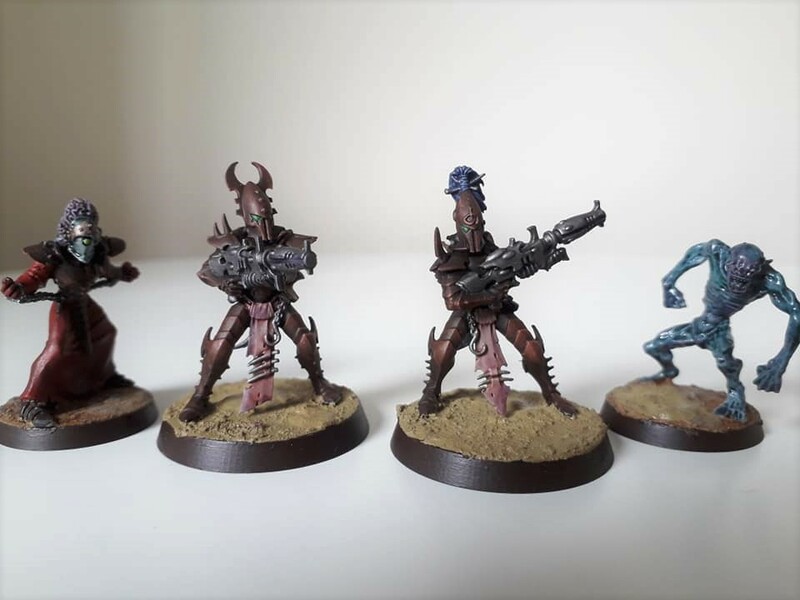 I’ve been faffing a bit with the above allied detachment for my Drukhari, something that can slot into the army with relative ease – though you’ll have to wait for my Drukhari blog before I go further into that! The dissonance weapons sound like they should be a lot of fun, S5 AP-2 and D3 damage, increasing to S6 AP-3 on the roll of a 6+. Quite how I’m going to get the pieces for these distinctive weapons, given the lack of the proper kit these days, but I’m thinking it might be just as easy to use a counts-as system for these chaps. 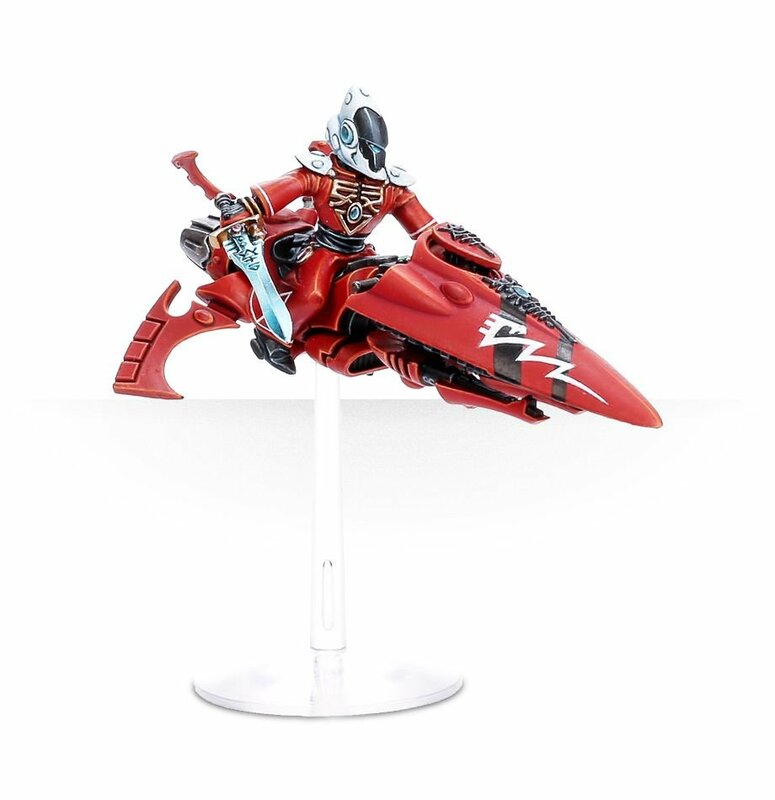 My thought has been to proxy Dire Avengers as the main Reaver band, and then use Windriders for the Cloud Dancers, with the Warlock Skyrunner as the Corsair Prince. It should be pretty basic, for sure, but I think it will work well enough, and I’m sure I can keep all of the counts-as stuff consistent! In all honesty, I have no idea when I’ll be able to actually get round to this project, as I have so much on my plate right now with the Great Reanimation of my Necrons, and the Skitarii project that I’m still persisting with. 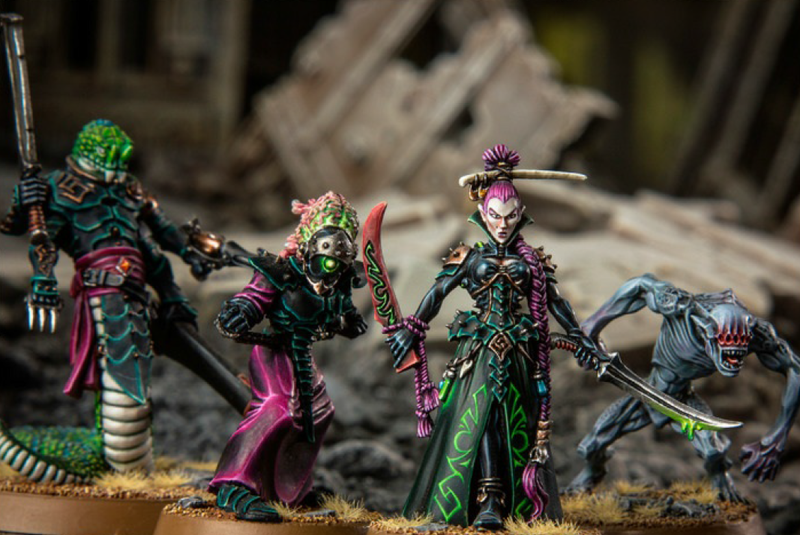 But hopefully I can get some space pirates onto the table with my Drukhari soon! 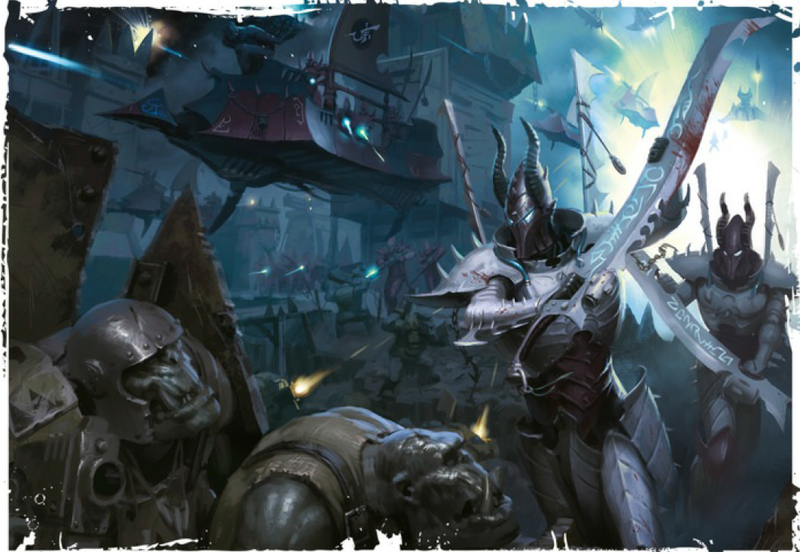 Author spalanzPosted on March 3, 2019 March 3, 2019 Categories WarhammerTags Corsairs, Craftworld, Dark Eldar, Drukhari, Eldar, Warhammer 40k1 Comment on Eldar Corsairs! 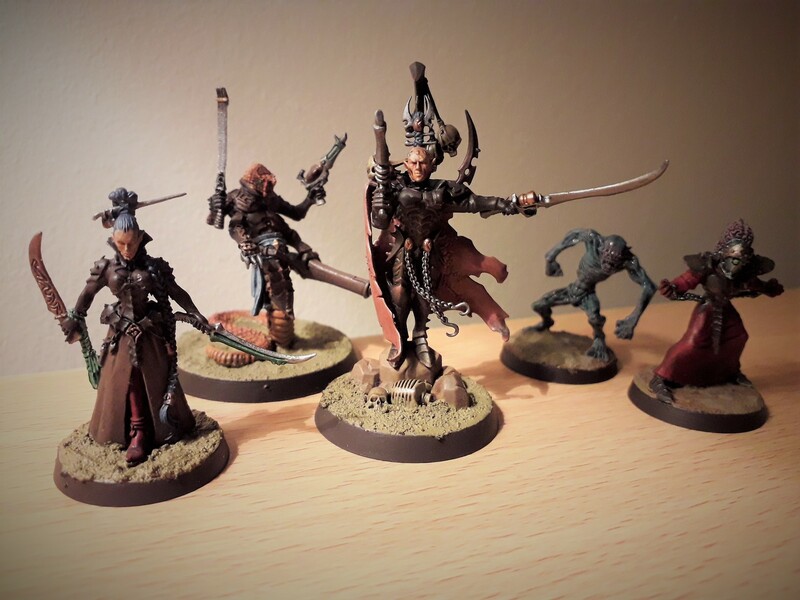 So, I’ve finally finished up the Court of the Archon for my Dark Eldar/Drukhari army, and I have to say, I’m pretty impressed with how they all look together on the tabletop now! We have the full Court here: from left to right, we have the Lhamaean, the Sslyth, the Archon himself, the Ur-ghul, and the Medusae. I’ll go into each of these in a little while. While I had included a Lhamaean in my army pretty much from its inception, I hadn’t really thought about including the rest of the Court, principally because they look just so damn weird! But, as time has gone on, I’ve seen the value in having so many ablative wounds for the Archon, and the weirdness can also be really fun, so I was happy to pop the whole lot in there. The Court of the Archon is something that, from what I can tell, has been around forever. A mercenary band of bodyguards for the big cheese, I do enjoy the idea that they are assembled by the Archon who is too paranoid to trust his regular Kabalite Warriors to guard him during a battle. 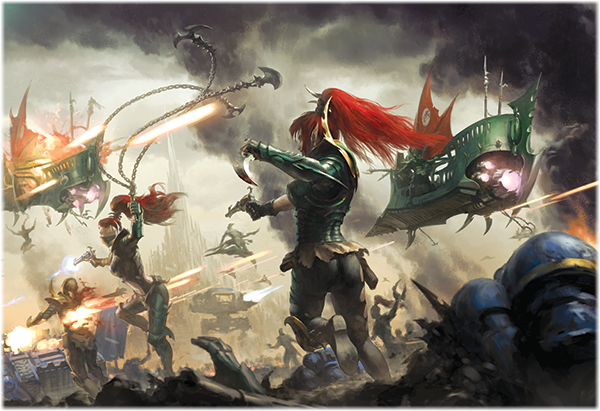 Slaves and pets, these retainers are so broken by the Archon’s will that they would rather die a hundred times over than see their master fall – it’s so very, very Dark Eldar, don’t you think? The Index changed their slot to Elite, and limited us so that we could only take a Court of four models for each Archon without using a slot. 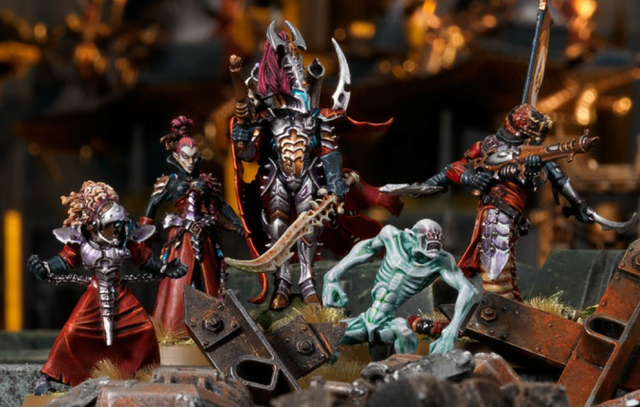 Now, in the new 8th edition Codex, we’re still limited to four models for matched play, and they can only be taken if you also include an Archon in your detachment. There is still some flexibility in that you can take, for example, four Medusae along with the Archon (although the rule of three would technically prevent that, but anyway). So what do these models do? In the main, Court of the Archon models are melee units that are almost designed to defend your Archon in a defensive cordon, preventing enemy units from targeting him in the shooting phase, and from charging him in the fight phase. The Sslyth are perhaps the most valued for being Strength and Toughness 5, whereas the others are all Toughness 3 so tend to fold easily, especially against dedicated melee fighters. Sslyth are also notable for being able to take shardcarbines, a fairly decent yet overlooked poison weapon that can only otherwise be taken by Scourges. Sadly, the Sslyth lost a wound between the Index and the Codex. Ur-ghul are truly hideous creatures of nightmare, whose brutal ferocity knows no bounds within the lore. Within the game, this translates to a flurry of attacks whenever the model charges – six attacks on the charge is fairly good for a 15 point model, but Strength 4 means he’s not going to be particularly standing-out. But I do feel the Ur-ghul embodies what the Court is all about – distraction units to draw the attention away from the Archon they’re guarding. Lhamaeans are the mistresses of poison, and lore-wise, an Archon will always seek to have such a creature close at hand to distill the finest venoms for his weaponry. The poisonous Shaimeshi blade carries a toxin so deadly it can cause the brain to swell until it bursts from the skull, or the skin of a victim to begin eating itself – “even a kiss blown upon the wind by a Lhamaean can kill in seconds”. And the model really embodies that air of deadly, sinister effectiveness, the way she’s holding the blade in a reverse-grip as she stalks slowly towards her prey… In game, we’ve got a fairly-decent melee unit that is more often than not killed before she can do anything. At least, in my experience! I’ve taken her a few times now, and when I remember to use her, she just seems to whiff. On paper, adding 2 to wound rolls and dealing out additional mortal wounds on 6+ should be really good, especially with all the myriad other buffs that can affect her such as Power from Pain and the Archon’s aura of re-rolling hits of 1 (or all failed hits if she’s even closer to the boss). For me, however, I’ve never managed to get that perfect storm running. Interestingly, the Lhamaean has lost her splinter pistol in the transition from Index to Codex. Finally, we have the Medusae, a weird emotional parasite native to the webway that Archons find particularly useful, as their strange powers of storing up extreme emotions during a battle allow their masters to later re-live the torments and agonies suffered by their foes. Basically a jellyfish-like collection of brains and spinal cord, the Medusae is kind of hilarious when you think that it is this weird brain-like creature that has taken over the body of another. 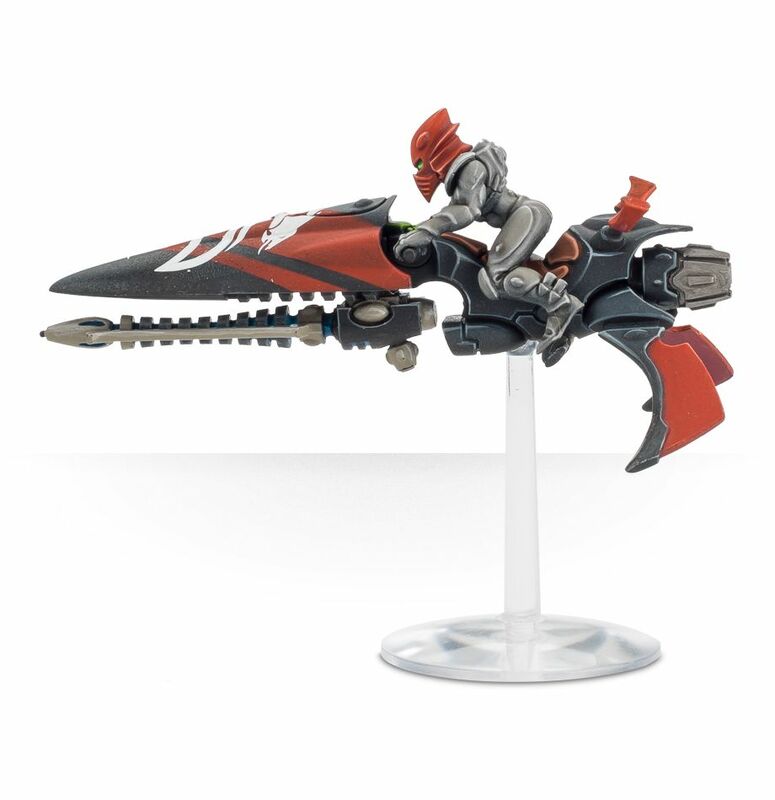 The second Court model that has a ranged weapon, the Medusae can open its host’s visor to unleash “a wave of raw anguish, plunging (the enemy) into a coma from which there is no recovery”. Formerly an Assault 1 flamer, it is now a much better Assault 4 attack with 1″ extra range compared with an actual flamer in 8th edition, though notably is not affected by the Kabal of the Obsidian Rose’s Obsession. 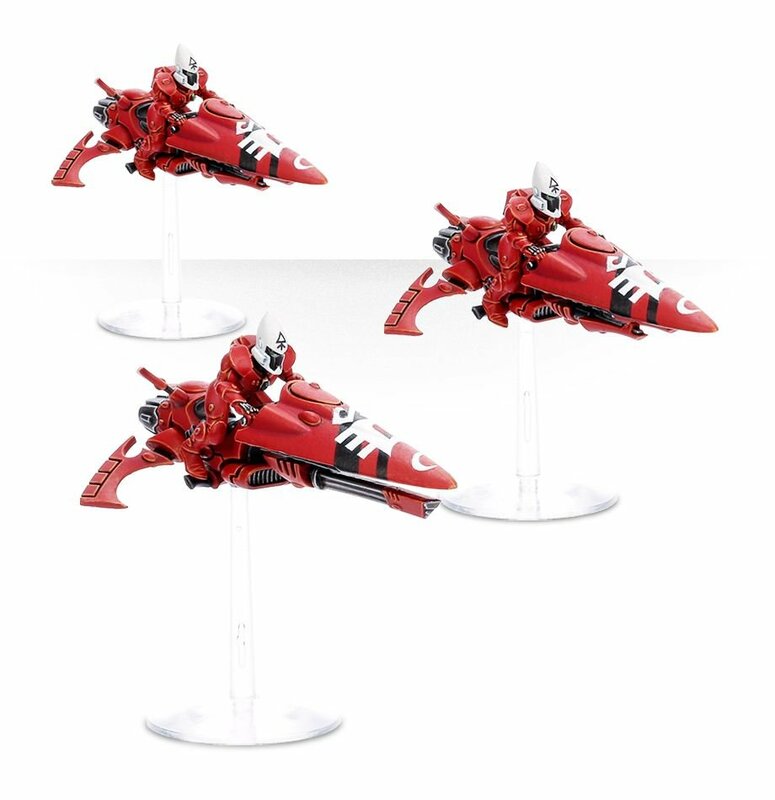 They are definitely fun models, and I think aside from the Sslyth, which is only taken for his bodyguard ability, none of these are taken in a competitive environment. But the Court as a whole is a unit dripping with theme, and I am really chuffed to have finally gotten all of them painted up and ready for action. In their first outing, they managed to keep my Archon alive, so what more do I want?! It’s been a Bank Holiday painting extravaganza for me this weekend! Having two days pretty much to myself, as the other half was in work, I’ve managed to make some amazing progress with clearing the backlog! First up, I’ve added five more Immortals to my new Thokt Dynasty that I was talking about the other day, giving me now two troops choices, an HQ and an Elites slot, along with a dedicated transport. Hooray! 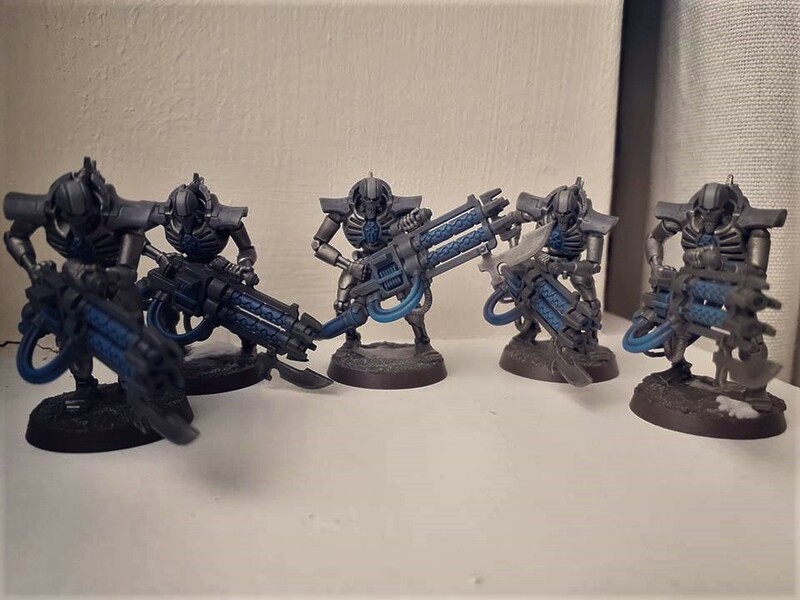 I’ve bitten the bullet and listed a lot of my older Necrons on ebay this weekend, in the hope that it prompts me to really make the effort and paint my current batch of unpainted models. If nothing else, I really want to get the Catacomb Command Barge and a third squad of Immortals painted (tesla this time), and then I’ll have the first Battalion ready! That’s also going to be well on the way to my first list finished, so we’ll see how far I can get with that… It only took me five months to get round to painting these, after all! Much like last weekend, I’ve been painting a mixture of Necrons and Dark Eldar, my true 40k loves! This weekend, I’ve managed to get the second Ravager finished – something that, annoyingly, I’d been very close to for a long time anyway, as I’d done the main hull back in April. The crew are finished, though, along with the crew for the next Raider that I’ll be working on, so that’s a very positive step! I’ve also finished off four infantry chaps, in the main because I had a game today and wanted to try out some different things! I’d built up all of these guys back in January, when I was building a lot of Dark Eldar as I was waiting for the Codex to drop, but have finally gotten round to painting them up. I’d picked the two blaster-wielding chaps to finish as I was painting the Ravager crew anyway, but now I need to get moving with another batch of Kabalite Warriors. I have a lot of these guys, as it happens, as I’d originally build up enough to get myself two full Battalions of pure Kabal. Then the Rule of Three came out, and without Drazhar, there aren’t enough HQs to now do this and keep the Kabal Obsession. So I lost interest in the idea, but have now started instead to think of either a Brigade with just three Archons (not even sure if that’s possible? 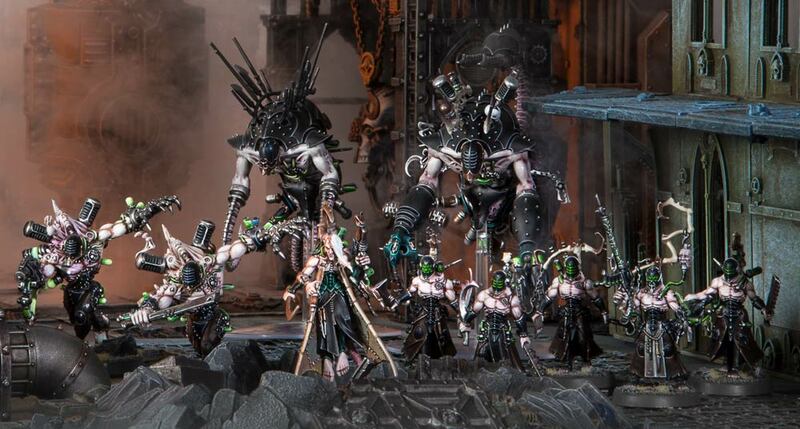 ), or else sticking with one Kabal Battalion but having a massive unit of Warriors on foot. I’m not entirely sure what I want to do yet, so we’ll see. I definitely want to get more of the special weapons peppered into my squads, so I’ll probably be working on some of those soon. 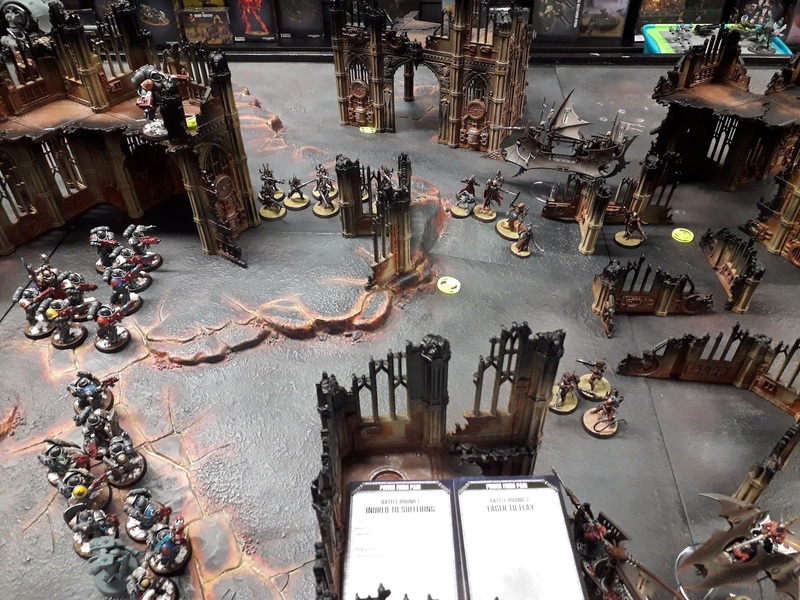 It may be nearly five months since I first picked this book up, but I have today had my first game with Codex Drukhari, and it was an absolute blast! 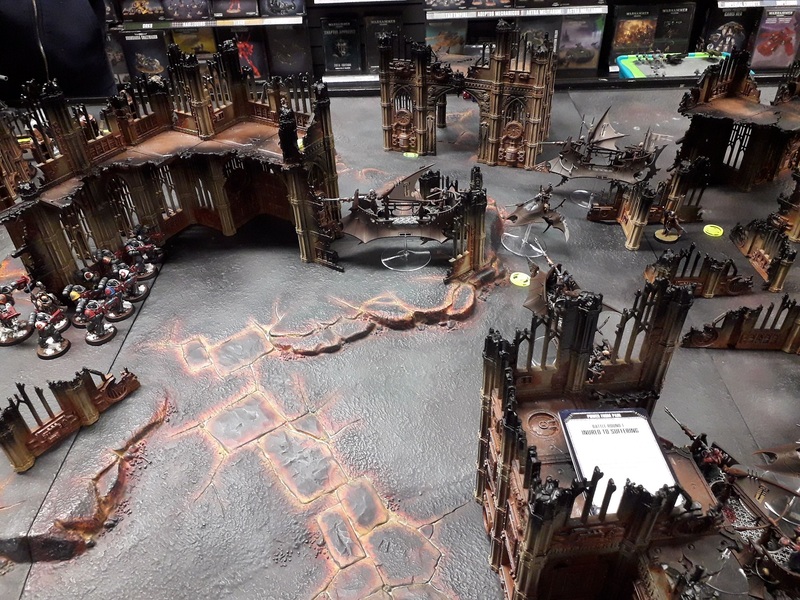 A chap at my local store was looking to try out an army list he’d come up with, but only at 550 points. So I set about building up a basic Patrol detachment, an HQ and two troops (ah, the old FOC!) 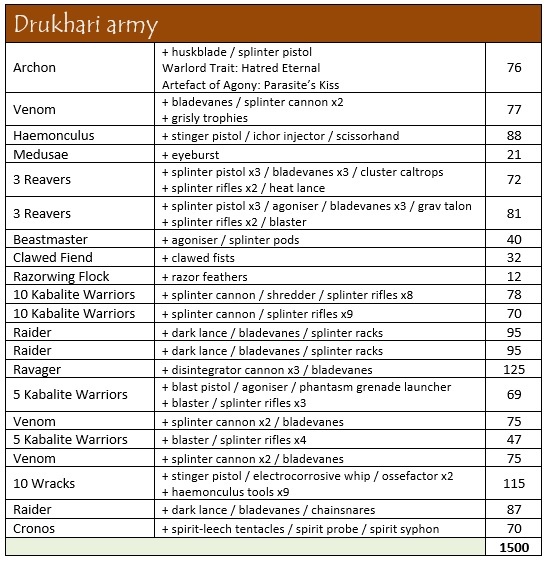 all in vehicles: two squads of 10 Kabalite Warriors in Raiders, including a splinter cannon in one, and a blaster/agoniser in the other; in a Venom, the Archon (splinter pistol/huskblade) along with a Court of Lhamaean, Ur-ghul and Medusae. Obviously, I was playing Kabal of the Obsidian Rose, so had some pretty decent range on all my weapons. On the Deathwatch side, there was a squad of Veterans, a squad of Terminators, and a Captain in Gravis Armour. As it happened, my opponent was as great at throwing dice as I was, so it all went quite well! Having nothing much to do against my army, as they were all in vehicles, it felt a bit one-sided, as I was able to shoot up the table from within my Raiders. I charged everybody out of the Venom just for something to do, though was quite impressed with some of the Court characters. I think I’ll look at using them more often! While I don’t think there’s been much change between the Index and the Codex, the addition of Obsessions is definitely something that I enjoyed. 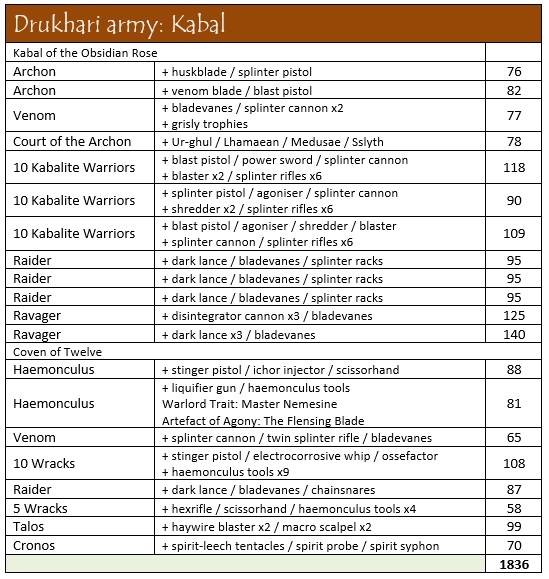 I’ve been playing about with some list ideas off and on for a while, and having been initially very keen to start a Wych Cult this year, I’m leaning more towards the Kabal/Coven lists I used to play during the Index days. So I’m busily planning to paint more stuff to make it what I hope will be a decent enough list to play, so stay tuned there! So, since my last update on the three armies that I’d wanted to get a move along with, I’ve done very little of any of them! Earlier this month, I had started work in earnest on the Tempestus Scions, though that was primarily for Kill Team rather than the 500-point list I’d outlined here. I blame the arrival of Kill Team and wanting to finish painting the Genestealer Cultists that I’d had one the table since way back when. Having finished a Neophyte Squad, I shouldn’t really complain, of course, but I’d really like to be further forward with a lot of these projects! 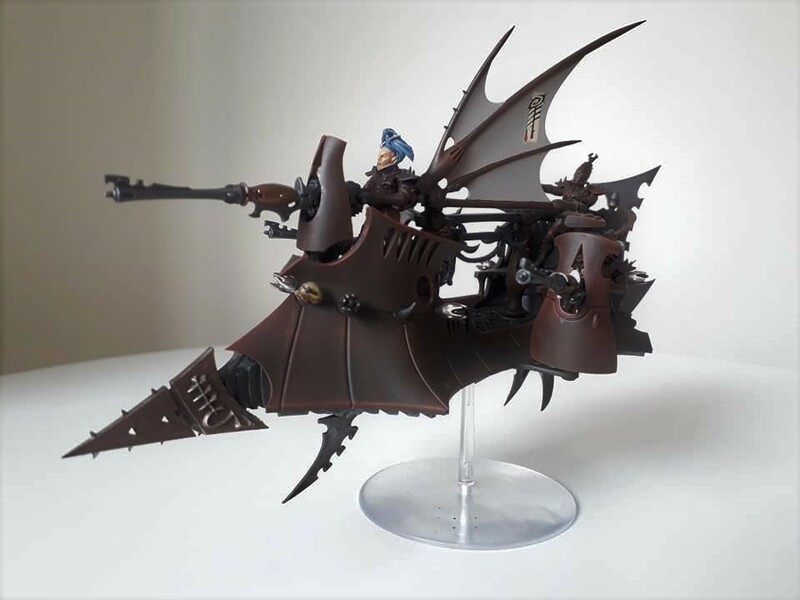 Author spalanzPosted on August 27, 2018 Categories painting, WarhammerTags Dark Eldar, Drukhari, Necrons, painting miniatures, Warhammer 40k1 Comment on Bank Holiday Painting Extravaganza!